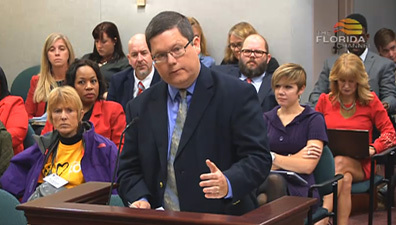 James Herzog, associate director for education, testifies in support of HB 829 during the subcommittee hearing. On January 23, HB 829 (Plasencia) was amended and passed by the PreK-12 Innovation Subcommittee with unanimous (12-0) bipartisan support. The measure reduces the prior-public-school-attendance requirement from a year to a semester or less for kindergarten to 12th grade students seeking to participate in the McKay Scholarship Program for Students with Disabilities. Though the bill is not as robust as the Senate companion, SB 1080, which removes the prior-year requirement in its entirety for grades K-5, it is a helpful step for parents seeking the best educational environment for their children.